Whether you are attending a dinner party, cocktail party or open house, it is customary to practice good etiquette by bringing a gift to your host and/or hostess. Hostess gifts are given upon arrival at the party and are an extra added touch to thank the host and/or hostess for the gracious invitation. The presentation is almost as important as the gift as itself. Even a simple gift is extra special, when wrapped in an artful way with beautiful wrapping or unique gift box with an eye catching ribbon. Bring your favorite Cabernet Sauvignon or Chardonnay wrapped in a decorative wine bag or elegantly wrapped box of Veuve Clicquot with a satin ribbon. As the recipient, write the names of the people who gave you the wine or champagne and the date. When you uncork and enjoy, send a quick email or handwritten thank you note to let them know how much you enjoyed the gift. Just adds the extra special touch that most people forget to do. 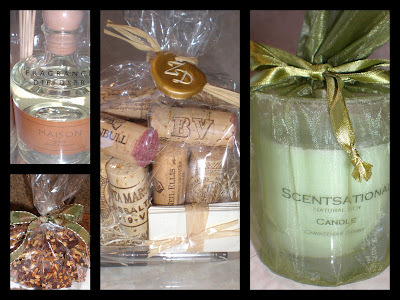 Keep a few extra candles in your gift closet that are wrapped in pretty paper with a gorgeous ribbon. You can shop for high-end brands such as: Diptyque, Fresh, Jo Malone, L’Occitane or Voluspa. A great tip for budget conscious Authentic Suburban Gourmet readers is to shop at TJ Maxx and stock up on great candles at a value. It always adds the extra special touch when you give something handmade. These can display your culinary or artistic talents. Create your favorite imix on itunes and copy to a CD. You can create music to match the theme of the party if appropriate. Make it even more special by designing the CD cover to personalize it for the host and/or hostess. As much as this is a traditional gift and thoughtful, the busy host/hostess may not have time to find a vase, cut stems, fill with water and arrange. If you decide to give flowers, have them already in a nice vase or have them delivered the day before from your favorite florist with a personal note. This gift keeps on giving with the lovely scent lasting for months, provided you “flip the sticks” every few days. I think these are such a wonderful gift and the hostess will always think of you as they pass by and smell the extrodinary scent. Can be found at TJ Maxx or high end retailers such as Neiman Marcus. A beautiful box of Godiva Chocolates or alike, is always a thoughtful gift. A lovely bottle of great olive oil, flavored vinegars, locally harvested honey, handcrafted jams or chutneys make a memorable gift that anyone would enjoy. Present it in a nice box, decorative bag or simply tie with a fabulous ribbon. These are widely available from your discount retailer to the small boutiques in town or local wine shops. Wrap in a beautiful box or decorative tin. Can give in conjunction with a bottle of wine or alone. Keep a few boxes of unique and traditional boxes of stationary on hand to give as a host and/or hostess gift. The art of the personal note is alive and well.